This is a follow up to a story from January about Sam Shubert’s experience in Los Angeles for the first semester. For Media Arts senior, Sam Shubert, extending his time at Bethany proved to be very beneficial. Now, five weeks from graduation, Shubert has a job and is applying his skill sets as he takes on the professional sector. Shubert was on track to graduate in December 2018 but delayed that a few months to improve his skillset. Trying new things has been the key to Sam’s success. Shubert spent the fall semester at LAFSC studying film production and interning at a rental house in Burbank, CA. This experience helped develop his confidence as he became the hockey productions cinematic style shooter when he returned to campus for the second semester. Bethany Lutheran College has a partnership to broadcast Minnesota State Men’s hockey game on Spectrum and run the video board in the arena. Minnesota State had a record-breaking season at home and Shubert was vital to capturing those moments. Shubert says you must be willing to try new things. “Get your hands on everything. There is so much to learn. Until you explore all those other avenues, you never really know where you want to go,” he said on the most recent BLC Studios podcast. 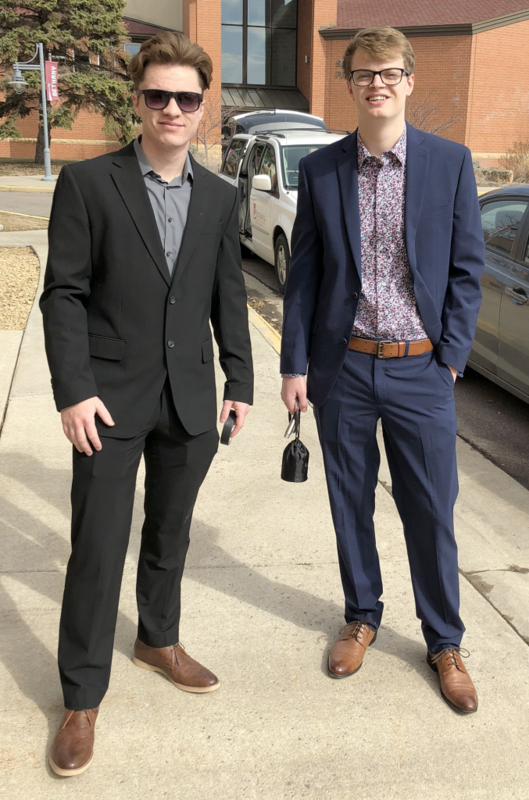 Freshman Matt Maisch and Senior Sam Shubert get ready to take off with Minnesota State men’s hockey to Providence, Rhode Island, for the NCAA Regional Tournament on March 28, 2019. Photo by Greg Vandermause. Shubert is already reaping those benefits as he was recently hired by Cambria out of Le Seuer, Minnesota, doing internal video production and graphic design. “You have to be will to jump into those roles you are unfamiliar with,” he said. As the school year winds down at Bethany, soon-to-be grads are polishing resumes and applying for jobs. For Sam Shubert, he’s a step ahead of the game by creating opportunities through hard work.